Hot galvanized,forged steel and tempered. 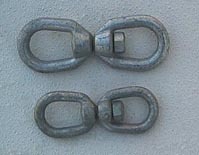 Used to prevent mooring chain from snarling. Normally placed between top and bottom chains but we prefer under the buoy.